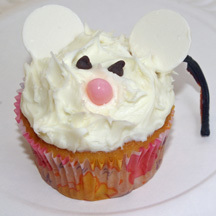 Here’s a cute little white mouse cupcake for any party, Christmas time, etc. Make a bunch of mice in different colors! The fuzzy look comes from “pulling” the frosting up with the edge of a butter knife or spatula. Also, get your melts from the supermarket bulk bin to save money while buying only what you need. What You Need: 1 cupcake; white frosting; 2 white chocolate “melts”; 2 mini chocolate chips; pink jelly bean or other pink candy; black string licorice. How to Make It: Frost cupcake with a thick layer of white icing (canned is fine). Use a butter knife or spatula edge and press lightly onto frosting and then pull up to create little peaks for a fuzzy appearance. Add wafer candies for ears as well as candy eyes and nose. Stick one end of licorice into back of mouse for tail. This entry was posted on Wednesday, May 4th, 2011 at 11:56 am	and is filed under animal cupcakes. You can follow any responses to this entry through the RSS 2.0 feed. Responses are currently closed, but you can trackback from your own site.